When my oldest daughter first started primary school, I rather enjoyed packing her lunch boxes each week, seeing what new and tasty things I could think up to put in there. And yes, you guessed it, the novelty wore off after about half a term. But every now and again I do try to put in a little extra effort. Most of the time my daughters are grateful for that effort, although we do have the occasional disaster when I wish I hadn’t bothered and had simply given them a cheese roll instead. 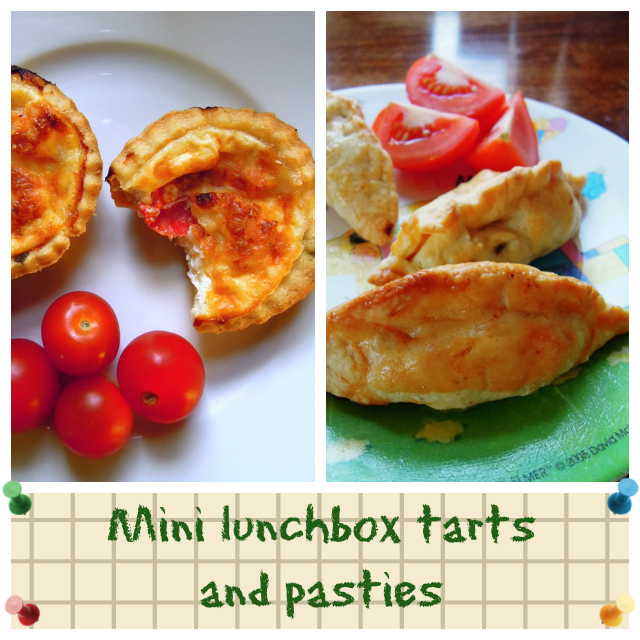 These mini pasties and tarts get the thumbs up from my two though. So if you do find you have a little extra time on your hands at the weekend and you’re in a baking mood, make up a big batch of these to see you through the week. They also freeze well too. Put the flour and salt into a mixing bowl. Rub in the butter and lard/vegetable fat using your finger tips until the mixture resembles large breadcrumbs. Gradually mix in the cold water using a knife until it comes together to form a dough. Bring it all together with your hands into a ball, wrap in clingfilm and place in the fridge for 20 minutes. Heat the olive oil in a large frying pan and saute the onion and carrot until soft and golden. Add the minced beef and fry until browned. Next add the black treacle, Worcestershire sauce, dried oregano and season with salt and pepper to taste. Cook for a couple more minutes and then stir in the chopped egg. Remove from the heat and allow to cool. Flour your work surface and roll out the pastry until about 2mm thick. Using a cup or small bowl about 9-10cm in diameter as a template, cut out circles of pastry. Into the middle of each pastry circle, spoon some of your beef filling. Fold the edges of the pastry up and pinch together to seal it into that classic pastry shape. Place each pasty onto a large baking sheet and when they’re all complete, brush the pastry with a little beaten egg. Bake the pasties in the oven for 10-15 minutes until they are a beautiful golden brown colour. Enjoy hot or cold. Next come the mini tarts. 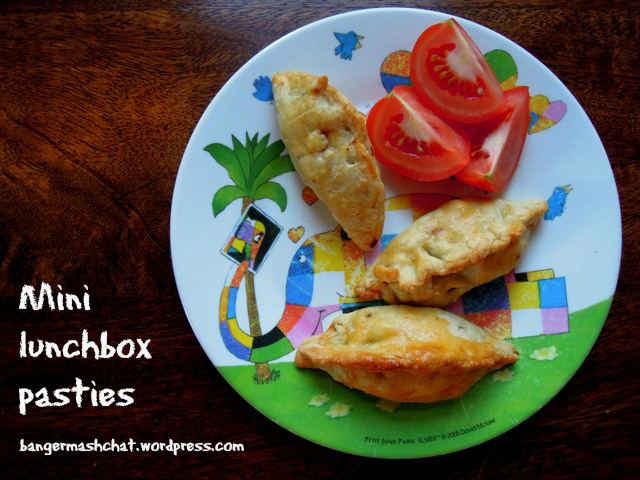 They are very versatile and you can add your children’s favourite ingredients. As well as cherry tomatoes, used here, we also include ham, sweetcorn, peas, chopped sausage, spinach, courgette, peppers – the options are pretty much endless. In a large bowl, mix together the flour and salt. Rub in the butter to form breadcrumbs. Combine with water to form a dough. Wrap in clingfilm and rest in the fridge for 20 minutes. Grease each of the cups of a 12-bun muffin tin with a little butter and dust with flour. Flour the work surface and roll out the pastry to around 2mm thick. Cut out circles using a fluted pastry cutter, slightly larger than the diameter of the cups in the muffin tin. Press the pastry circles into the muffin tin. Mix together the eggs and half the grated cheese, and season with salt and pepper. Pour into the pastry moulds. Pop two halves of cherry tomato into each tart and sprinkle with the remainder of the cheese. Bake in the oven for around 15 minutes until the pastry is golden and the filling is set. Enjoy hot or cold. 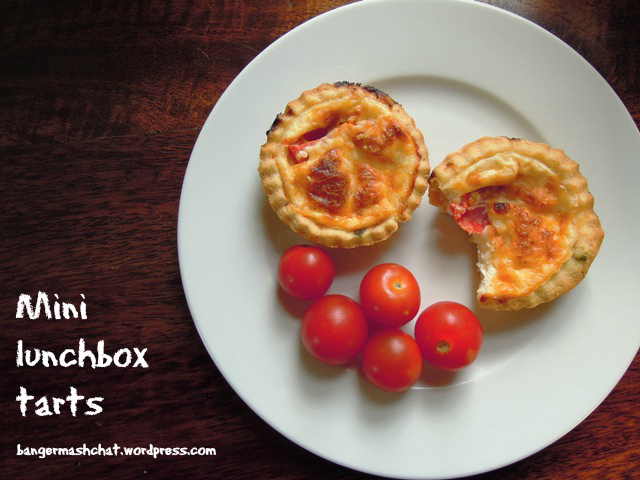 These tarts and pasties are my entry into this month’s Family Foodies challenge, which I am co-hosting with Lou at Eat Your Veg. The theme this month is Lunchbox Ideas. We’ve already received some great entries – why not pop over and take a look? Or how about sharing your own favourite lunchbox filler? 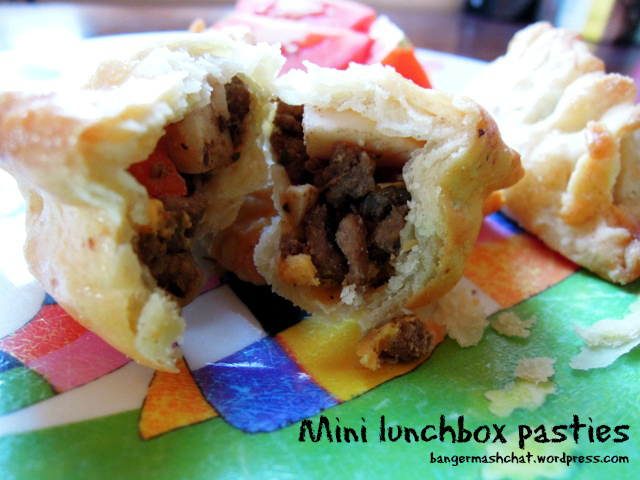 I bet the girls were delighted with finding an oh so cute mini pasty or tart in their lunchbox, I certainly would be!. My kids are suddenly pasty fiends so I should really get myself into baking gear and make a batch, they sound very delish, and I’m loving the treacle addition. A very fine Family Foodies’ Lunchbox entry! Thanks Lou. Yes treacle seem to be appearing in my cooking quite a bit at the moment. I came across a chilli beef recipe which used it, so I’ve been using it in casseroles and all sorts ever since! What lucky children to have such scrummy lunch boxes, these look fab. Would never have thought of adding treacle to pasties but they look wonderful, must give it a go.